At Muskoka Zip Lines and Aerial Park, we respect your privacy and value our relationship with you. Your personal information will be protected, will never be sold. Our goal is to enhance your product and service experience with us. Yes. We may collect and store information about your visit on an anonymous, aggregate basis using “cookie” technology. A cookie is an element of data that a Web site can send to your browser, which may then store the cookie on your hard drive. Cookies may tell us the time and length of your visit, the pages you look at on our sites, and the site you visited just before coming to ours. We may also record the name of your Internet service provider. This information allows us to measure site activity to tailor the consumer’s experience within our Web site. The goal is to save you time and provide you with a more meaningful visit. Cookies used by Muskoka Zip Lines and Aerial Park on its Web sites are solely to facilitate navigation and security across the site, and are not used to capture or reveal any of your personal information. If you are concerned about cookies, you may modify your browser settings to notify you when you receive a cookie. If you do not know how to modify your browser settings please consult your browser documentation or the supplier web site. You may visit the Muskoka Zip Lines and Aerial Park site with your cookies turned off. However, you may not be able to access some of the areas of our site, which require cookies for customization and personalization. We may also use third parties to serve Muskoka Zip Lines and Aerial Park advertisements on other Web sites. 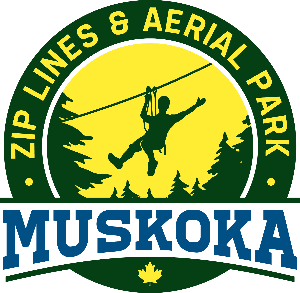 In serving Muskoka Zip Lines and Aerial Park advertisements these third parties may place cookies on your browser computer and may collect certain anonymous information about your visits to other Web sites. This information includes browser type, IP address, Web activity and time of day and is used to better understand and optimize Muskoka Zip Lines and Aerial Park’s online advertising campaigns. To opt-out of these cookies, please review the privacy policies of that web site and follow the instructions on their site.